MK Dov Khenin requests that Defense Minister Ya'alon not demolish buildings of Arab squatters on ancient Jewish village. 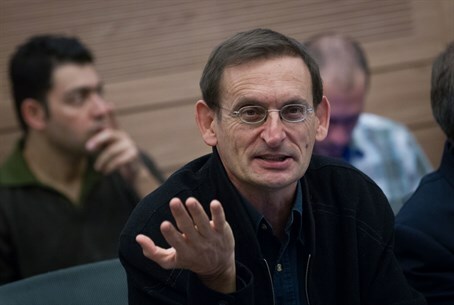 MK Dov Khenin, a Jewish member of the Arab Communist Hadash party that merged into the Joint Arab List, turned to Defense Minister Moshe Ya'alon (Likud) on Monday in a request not to demolish an illegal Arab settlement built on an ancient Jewish village. The Israeli Supreme Court has given the green light for the demolition of 80 illegal structures in Arab Susya, significantly located on the ancient village of Susya in the Har Hevron region of southern Judea. Last Thursday demolition orders were distributed to the Arab squatters. The Arab settlers petitioned the Supreme Court - after previous similar petitions were shot down by the court - with a debate to be held on August 3, but the IDF has decided not to wait and instead act on the authority of the Supreme Court's ruling on previous petitions. "I turn to you in a demand to immediately cancel the demolition threats hanging over the houses of the residents, and the attempt to conduct underhanded opportunism even before the court discusses their petition," wrote Khenin. The MK added, "it can't be that the rights to a roof of 250 residents of the village will be trampled on." Khenin's demand comes after US State Department spokesperson John Kirby last Thursday warned Israel not to demolish the Arab settlement, in a pre-scripted message that stood in stark contrast to the rest of his ad lib answers in the press briefing. "We strongly urge the Israeli authorities to refrain from carrying out any demolitions in the village," warned Kirby. "Demolition of this Palestinian village or of parts of it, and evictions of Palestinians from their homes, would be harmful and provocative. Such actions have an impact beyond those individuals and families who are evicted." Kirby said the demolition may "worsen the atmosphere for a peaceful resolution and would set a damaging standard for displacement and land confiscation particularly given settlement-related activity in the area." Susya was built adjacent to the Jewish community of Susya which was established in 1983. Problematically, the Arab town was built on the archaeological site of ancient Susya, a Jewish village from the Temple Period. While Arab squatters and leftists have claimed an Arab historical connection to the site, historical documents have thoroughly debunked that claim, showing how the Arab village is a very recent phenomenon whereas the ancient Jewish connection to the site is established in the records. Tzviki Bar-Hai, then head of the Har Hevron regional council, told Arutz Sheva in late 2013 that the Arab presence in Susya is very recent, revealing that those claiming to be residents of the town only came in the late 1980s from the nearby Arab village of Yatta.